Ultrasound screening during pregnancy has resulted in increasing recognition of fetal hydronephrosis. Depending on diagnostic criteria and gestation, the prevalence of antenatally detected hydronephrosis (ANH) ranges from 0.6 to 5.4%. ,,,,, The condition is bilateral in 17-54% and additional abnormalities are occasionally associated. ,, The outcome of ANH depends on the underlying etiology [Table 1]. Although ANH resolves by birth or during infancy in 41-88% patients ,,, urological abnormalities requiring intervention are identified in 4.1-15.4% ,, and rates of vesicoureteric reflux (VUR) and urinary tract infections (UTI) are several-fold higher. , It is important to distinguish infants with significant illness that require long-term follow-up or surgery, from those with transient hydronephrosis and minimum need for invasive investigations. Guidelines from the Indian Society of Pediatric Nephrology (ISPN) on management of ANH were published in 2000. During the last decade, there is better understanding regarding its often benign natural history and risk factors for postnatal pathology. Recommendations from other expert groups, including the Society for Fetal Urology (SFU) have been published. , This document revises the ISPN guidelines and has been simultaneously published in the February 2013 issue of the Indian Pediatrics. Subsequently, each guideline was assigned one of two levels of recommendation, based on assessment of relative benefit versus harm. Level 1. Recommendation applicable to most subjects, based on consistent information confirming benefit over harm or vice versa. Level 2. Suggestion or option based on equivocal or insufficient evidence and with unclear balance of benefit over harm, which may require modification when managing a patient. We recommend that ANH be diagnosed and its severity graded based on anteroposterior diameter (APD) of the fetal renal pelvis (1B). ANH is present if the APD is ≥4 mm in second trimester and ≥7 mm in the third trimester. While the renal pelvic APD [Figure 1] varies with gestation, maternal hydration and bladder distension, it is an objective parameter with small intraobserver and interobserver variation. ANH is present if fetal renal APD is ≥4 mm in the second trimester and ≥7 mm in third trimester. Hydronephrosis is further graded as mild, moderate, or severe [Table 3]. A cross-sectional study shows that the upper limit for normal renal APD during late gestation is 7 mm. An APD cutoff ≥7 mm at 18-weeks or later distinguishes fetuses with postnatal reflux or obstruction from those without significant pathology. , Renal APD thresholds of 5 mm and 8-10 mm in the second and third trimester, respectively were 100% sensitive in predicting the need for postnatal surgery,  compared with a study where third trimester threshold of 10 mm missed 25% cases of pelviureteric junction obstruction and 50% cases of VUR. Others also propose that fetal renal APD greater than 4-5 mm in the second trimester and 7 mm in third trimester is abnormal. ,,, While lower cut-offs for defining hydronephrosis increase the sensitivity for detecting anomalies, it reduces specificity. If ANH is detected, we recommend that the ultrasound at 16-20 weeks gestation also include evaluation for lower urinary tract obstruction, renal dysplasia, and extrarenal structural malformations (1C). We recommend that fetuses with ANH, and a major structural anomaly or additional soft sign(s) be referred to an obstetric unit with facilities for genetic counseling and prenatal testing (1C). Antenatal ultrasonography, in conjunction with maternal age and first or second trimester blood screen, helps determine the risk of chromosomal disorders and need for karyotyping. , The likelihood of aneuploidy in fetuses with isolated ANH is low ,, and karyotyping is not necessary. The risk of aneuploidy is increased in fetuses with ANH and a major structural anomaly , or with one or more additional soft signs , [Table 4]. Patients with these features require referral to a center with facilities for prenatal diagnosis and counseling. The decision regarding invasive testing is individualized, based on potential benefits and risks, and should occur at an appropriate time. In fetuses with unilateral hydronephrosis, we recommend that at least one follow-up ultrasound be performed in the third trimester (1B). 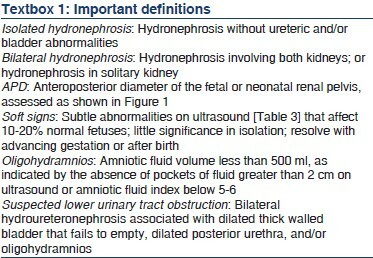 We suggest that fetuses with bilateral hydronephrosis be monitored frequently (2C). The frequency of monitoring varies from 4 to 6 weeks, depending on gestation at which ANH was detected, its severity and presence of oligohydramnios. The gestation at which hydronephrosis is detected and its course on sequential ultrasound scans has prognostic value. ,,,, Almost 80% of fetuses diagnosed in the second trimester show resolution or improvement of findings ,, with low likelihood of postnatal sequelae. , Patients with persistence or worsening hydronephrosis in the third trimester show higher rates of postnatal pathology and require close follow-up. ,,,,,, Sairam et al., found that 88% cases with mild ANH resolved in utero or neonatal period, while one in three neonates with moderate to severe hydronephrosis persisting in the third trimester required postnatal surgery. Hence, an ultrasound in the third trimester is valuable for identifying fetuses that require postnatal evaluation and follow-up. The risk of in utero worsening is higher for bilateral than for unilateral disease. While a recent report suggests that patients with mild to moderate isolated bilateral hydronephrosis have a favorable outcome,  close follow-up is necessary since a proportion may show progression or require surgery. Although there are limited studies that address frequency of monitoring,  we suggest that fetal imaging be repeated every 4-6 weeks depending on severity of hydronephrosis, gestation and presence of oligohydramnios. Fetuses with findings suggestive of lower urinary tract obstruction (bilateral hydroureteronephrosis, dilated bladder and oligohydramnios) might require even more frequent monitoring. We suggest that diagnostic and therapeutic interventions be considered for fetuses with suspected lower urinary tract obstruction and oligohydramnios only at specialized centers, following one-to-one counseling (2A). 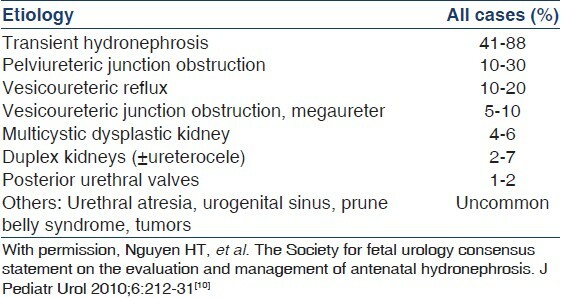 Termination of pregnancy is not recommended in fetuses with unilateral or bilateral ANH, except in presence of extrarenal life threatening abnormality (1D). Pregnancy in fetuses with unilateral or bilateral ANH should proceed to term, except if complicated by severe oligohydramnios or major structural anomalies. Early delivery is not indicated, and carries risks of prematurity and low birth weight. We recommend that all newborns with history of ANH should have postnatal ultrasound examination within the first week of life (1B). In neonates with suspected posterior urethral valves, oligohydramnios or severe bilateral hydronephrosis, ultrasonography should be performed within 24-48 h of birth (1C). In all other cases, the ultrasound should be performed preferably within 3-7 days, or before hospital discharge (1C). It is emphasized that an ultrasound in the first few days of life underestimates the degree of pelvic dilatation due to dehydration and a relatively low urine output. , Despite this limitation, an early ultrasound, within 24-48 h of birth, is necessary in neonates with suspected lower urinary tract obstruction, oligohydramnios and bilateral severe hydronephrosis or severe hydronephrosis in a solitary kidney. In others, the first ultrasound examination should ideally be delayed until the end of first week. Since there is a risk that a proportion of patients might be lost to follow-up,  we propose that neonates with unilateral or mild to moderate bilateral hydronephrosis be screened by ultrasonography prior to hospital discharge. We recommend that assessment of severity of postnatal hydronephrosis be based on the classification proposed by SFU or anteroposterior diameter of the renal pelvis (1B). We suggest that ultrasonography should include evaluation for calyceal or ureteric dilation, cortical cysts and enhanced renal echogenicity, and bladder wall abnormalities (2D). We recommend that neonates with normal ultrasound examination in the first week of life should undergo a repeat study at 4-6 weeks (1C). We recommend that infants with isolated mild unilateral or bilateral hydronephrosis (APD < 10 mm or SFU grade 1-2) should be followed by sequential ultrasound alone, for resolution or progression of findings (1C). Most patients with mild hydronephrosis (SFU grade 1-2; renal APD < 10 mm) do not have significant obstruction and maintain kidney function on the long-term. The intensity of evaluation for milder grades of hydronephrosis has therefore declined. ,, Recent cohorts with unilateral or bilateral hydronephrosis with APD up to 10 mm  or 15 mm , have been followed successfully, relying on clinical features, ultrasonography and counseling parents for surveillance for UTI. Hydronephrosis resolves in most such patients during the first 2-years of life, and radiologic investigations or antibiotic prophylaxis is usually not necessary. The policy to follow these neonates with sequential ultrasonography to monitor for resolution of hydronephrosis therefore seems satisfactory. We recommend that a micturating cystourethrogram (MCU) be performed in patients with unilateral or bilateral hydronephrosis with renal pelvic APD > 10 mm, SFU grade 3-4 or ureteric dilatation (1B). We recommend that MCU be performed early, within 24-72 h of life, in patients with suspected lower urinary tract obstruction (1D). In other cases, the procedure should be done at 4-6 weeks of age. We recommend MCU for infants with antenatally detected hydronephrosis who develop a urinary tract infection (1C). Lower urinary tract obstruction (most commonly posterior urethral valves in boys; occasionally bilateral ureteroceles) is an important cause of ANH and requires prompt management. Ultrasonographic findings of posterior urethral valves are: (i) bilateral hydroureteronephrosis, (ii) dilated, thick-walled bladder that fails to empty, and (iii) dilated posterior urethra. Since these patients are at risk for progressive kidney disease and recurrent UTI, an early MCU (within 1-3 days of life) enables prompts intervention. We recommend that infants with moderate to severe unilateral or bilateral hydronephrosis (SFU grade 3-4, APD >10 mm) who do not show VUR should undergo diuretic renography (1C). We suggest that infants with hydronephrosis and dilated ureter(s) and no evidence of VUR undergo diuretic renography (2C). The preferred radiopharmaceuticals are 99m Tc-mercaptoacetyltriglycine ( 99m Tc-MAG3), 99m Tc-ethylenedicysteine ( 99m Tc-EC) or 99m Tc-diethylenetriaminepentaacetic acid (DTPA) (2D). The differential function is estimated and renogram curve inspected for pattern of drainage. We suggest that diuretic renography be performed after 6-8 weeks of age (2D). The procedure may be repeated after 3-6 months in infants where ultrasound shows worsening of pelvicalyceal dilatation (2D). Diuretic renography allows differentiation between obstructive and non-obstructive hydronephrosis and estimating relative renal function. Radiopharmaceuticals such as 99m technetium mercaptoacetyltriglycine ( 99m Tc-MAG3) or ethylenedicysteine ( 99m Tc-EC) are preferred, since they show greater renal extraction and higher kidney to background ratio compared to diethylenetriaminepentaacetic acid ( 99m Tc-DTPA). ,, However, DTPA is inexpensive and widely available. Many patients require repeat renography, when change in differential function and drainage pattern is compared. The timing of the repeat procedure is not defined, and varies with patient age, initial renal function and persistence or worsening of ultrasonographic findings. The tracer used for the first renogram and timing of diuretic administration should be similar during serial evaluations. We recommend that infants with lower urinary tract obstruction be immediately referred to a surgeon for appropriate intervention (1C). We suggest that surgery be considered in patients with obstructed hydronephrosis, and either reduced differential renal function or its worsening on repeat evaluation (2C). We suggest that surgery be considered in patients with bilateral hydronephrosis or hydronephrosis in solitary kidney showing worsening dilatation and deterioration of function (2D). We recommend that parents of all infants with antenatal or postnatal hydronephrosis be counseled regarding the risk of urinary tract infections and need for prompt management (1B). We recommend that infants with postnatally confirmed moderate or severe hydronephrosis (SFU 3-4; renal APD > 10 mm) or dilated ureter receive antibiotic prophylaxis while awaiting evaluation (1C). We recommend that all patients detected to have VUR receive antibiotic prophylaxis through the first year of life (1B). Infants with ANH, including where hydronephrosis has resolved postnatally, have an increased risk of UTI. , Walsh et al., retrospectively estimated that the relative risk of developing pyelonephritis in these infants was 11.8 (95% confidence interval 6.8-20.5). The rates of UTI have varied, based on severity of hydronephrosis, duration of follow-up and antibiotic use. Infections were reported in 1.6-7.2% infants with ANH administered antibiotic prophylaxis ,, and 3.9-10% of those not receiving prophylaxis. ,,, In patients with isolated hydronephrosis (postnatal renal pelvic APD 5-15 mm) followed without prophylaxis, the frequency of UTI was similar in patients with bilateral (9%) or unilateral (10%) disease. Parents should be counseled regarding the increased risk of UTI, and the need for prompt diagnosis and treatment. Coelho et al., reported that infants with postnatal renal pelvic APD of 10 mm or more have significantly increased risk of infections (relative risk 2.6, 95% confidence interval 1.2-5.8) compared with those with mild hydronephrosis. Other studies have confirmed this finding ,, and suggest that most UTI occur within the first 6 months of life. While a significant proportion of infections occur in the context of underlying VUR, other risk factors include ureteric dilatation , and underlying obstruction. , In a recent meta-analysis including 3876 infants, it was demonstrated that neonates with high grade hydronephrosis receiving antibiotic prophylaxis have a significantly lower rate of UTI when compared to untreated neonates (14.6% versus 28.9%; P <0.01), while the rates of UTI were low for neonates with low grade hydronephrosis, regardless of status of antibiotic prophylaxis (2.2% on prophylaxis versus 2.8% without). Thus, only 7 patients with high-grade hydronephrosis are required to be treated with antibiotic prophylaxis in order to prevent one UTI. The efficacy of antibiotic prophylaxis in preventing UTI in patients with VUR has been questioned. ,, While awaiting results of further studies, the ISPN currently recommends that infants with VUR should receive antibiotic prophylaxis, the duration determined by the grade of reflux and occurrence of breakthrough infections. The American Urological Association also recommends that antibiotic prophylaxis be given to infants with VUR grade III-V that is identified through screening. They further suggest that, although evidence is limited, infants with lower grades of VUR (grade I-II) may also receive prophylaxis. In view of difficulties of detecting UTI in infancy and risks of renal scarring,  we recommend antibiotic prophylaxis for all infants with VUR detected through screening. Antibiotics that are preferred include cephalexin (10 mg/kg/d) during the first 3 months of life, and cotrimoxazole (1-2 mg/kg/d) or nitrofurantoin (1 mg/kg/d) later. In absence of prospective controlled studies, there is variability in practice regarding use of antibiotics in children with moderate to severe obstructive hydronephrosis. The rates of UTI were 0-4.3% in studies on patients with severe hydronephrosis due to pelviureteric junction obstruction or megaureter, managed without prophylaxis. , Madden et al., showed that the rates of UTI were similar at 14% and 16% in infants followed with or without prophylaxis, respectively. Other studies show that 19-36.2% of patients with moderate or severe obstructive hydronephrosis have UTI. , Further studies are necessary to determine the benefit of antibiotic prophylaxis in patients with obstructive hydronephrosis. Radiocontrast and radionuclide studies are associated with considerable risk of radiation exposure. The exposure following these studies is several-fold higher than a chest radiograph. ,, Recent findings from a large cohort of patients undergoing repeated CT scans show that cumulative doses of 50-60 mGy (equivalent to 50-60 mSv of X-ray radiation) were associated with 3-fold increased risk of leukemia and brain cancer. Physicians should be aware of the risks associated with these investigations [Table 5]. ,,, Repeat radionuclide and radiocontrast studies should be done only if these are likely to provide clinically relevant information that cannot be obtained by ultrasonography. Intravenous urography should not be used as an alternative to radionuclide scans. Magnetic resonance urography provides useful information, but is not freely available, requires sedation, and is associated with risks in patients with impaired renal function. [Figure 3] and [Figure 4] summarize the guidelines for management of patients with ANH. 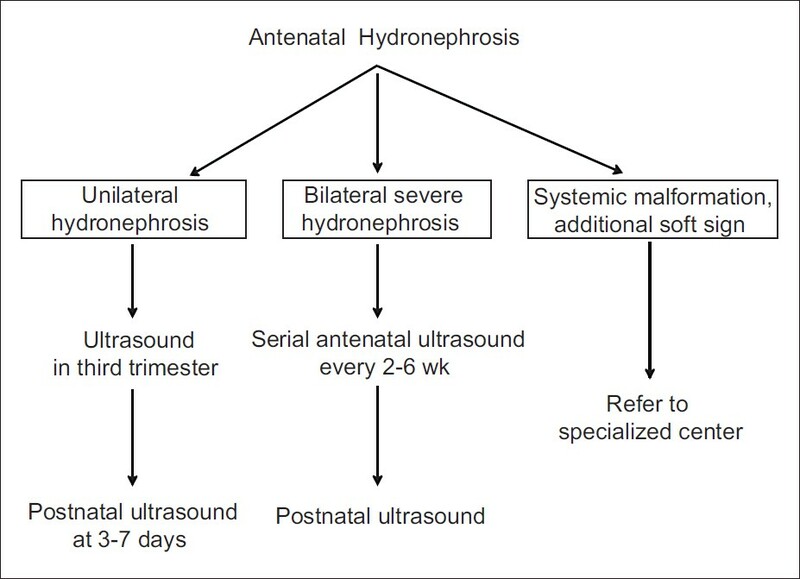 While a significant proportion have transient hydronephrosis that resolves in utero or postnatally, neonates with persistent hydronephrosis require follow-up. All neonates with hydronephrosis should undergo urinalysis, measurement of blood pressure, and estimation of serum creatinine. Infants with moderate to severe hydronephrosis are screened for urinary tract obstruction or VUR. The initial evaluation aims to detect patients with bladder obstruction, which requires prompt intervention. 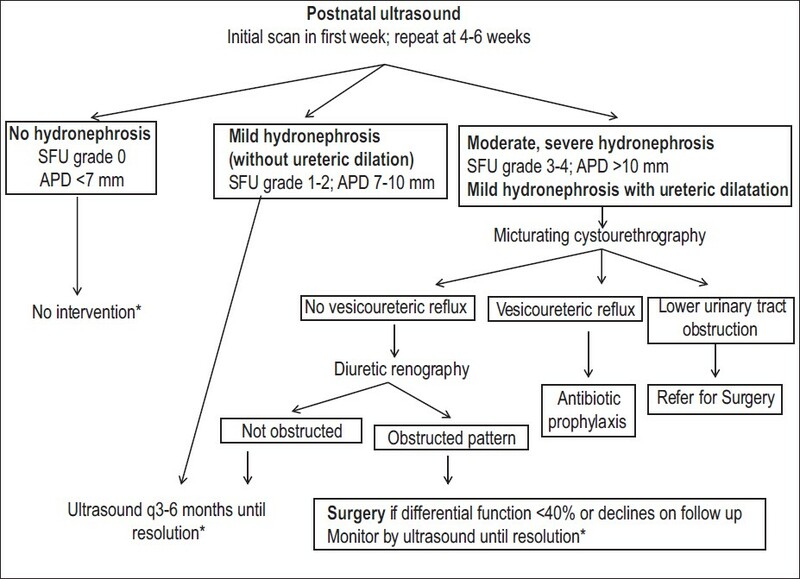 Decisions regarding surgical intervention, in other patients with obstructive hydronephrosis, depend on a combination of clinical and laboratory features, and results of sequential ultrasonography and diuretic renography. We thank Dr. Paul Winyard, Head of Nephro-Urology Unit, UCL Institute of Child Health, London (UK) for reviewing the manuscript. 1. Mallik M, Watson AR. Antenatally detected urinary tract abnormalities: More detection but less action. Pediatr Nephrol 2008;23:897-904. 2. Dudley JA, Haworth JM, McGraw ME, Frank JD, Tizard EJ. Clinical relevance and implications of antenatal hydronephrosis. Arch Dis Child Fetal Neonatal Ed 1997;76:F31-4. 4. Ek S, Lidefeldt KJ, Varricio L. Fetal hydronephrosis; prevalence, natural history and postnatal consequences in an unselected population. Acta Obstet Gynecol Scand 2007;86:1463-6. 5. Livera LN, Brookfield DS, Egginton JA, Hawnaur JM. Antenatal ultrasonography to detect fetal renal abnormalities: A prospective screening programme. BMJ 1989;298:1421-3. 6. Sairam S, Al-Habib A, Sasson S, Thilaganathan B. Natural history of fetal hydronephrosis diagnosed on mid-trimester ultrasound. Ultrasound Obstet Gynecol 2001;17:191-6. 7. Lee RS, Cendron M, Kinnamon DD, Nguyen HT. Antenatal hydronephrosis as a predictor of postnatal outcome: A meta-analysis. Pediatrics 2006;118:586-93. 8. de Kort EH, Bambang Oetomo S, Zegers SH. The long-term outcome of antenatal hydronephrosis up to 15 millimetres justifies a noninvasive postnatal follow-up. 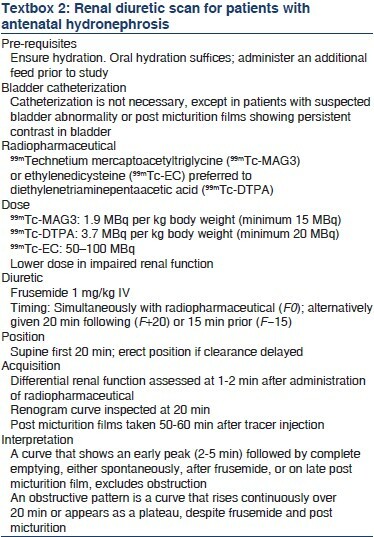 Acta Paediatr 2008;97:708-13. 9. Broadley P, McHugo J, Morgan I, Whittle MJ, Kilby MD. The 4 year outcome following the demonstration of bilateral renal pelvic dilatation on pre-natal renal ultrasound. Br J Radiol 1999;72:265-70. 10. Nguyen HT, Herndon CD, Cooper C, Gatti J, Kirsch A, Kokorowski P, et al. The Society for Fetal Urology consensus statement on the evaluation and management of antenatal hydronephrosis. J Pediatr Urol 2010;6:212-31. 11. Passerotti CC, Kalish LA, Chow J, Passerotti AM, Recabal P, Cendron M, et al. The predictive value of the first postnatal ultrasound in children with antenatal hydronephrosis. J Pediatr Urol 2011;7:128-36. 12. Ouzounian JG, Castro MA, Fresquez M, al-Sulyman OM, Kovacs BW. Prognostic significance of antenatally detected fetal pyelectasis. Ultrasound Obstet Gynecol 1996;7:424-8. 13. Walsh TJ, Hsieh S, Grady R, Mueller BA. Antenatal hydronephrosis and the risk of pyelonephritis hospitalization during the first year of life. Urology 2007;69:970-4. 14. Indian Pediatric Nephrology Group, Indian Academy of Pediatrics. Consensus statement on management of antenatally detected hydronephrosis. Indian Pediatr 2001;38:1244-51. 15. Psooy K, Pike J. Investigation and management of antenatally detected hydronephrosis. Can Urol Assoc J 2009;3:69-72. 16. Van den Hof MC, Wilson RD, Diagnostic Imaging Committee, Society of Obstetricians and Gynaecologists of Canada, Genetics Committee, Society of Obstetricians and Gynaecologists of Canada. Fetal soft markers in obstetric ultrasound. J Obstet Gynaecol Can 2005;27:592-636. 17. Breathnach FM, Fleming A, Malone FD. The second trimester genetic sonogram. Am J Med Genet C Semin Med Genet 2007;145C: 62-72. 18. Pereira AK, Reis ZS, Bouzada MC, de Oliveira EA, Osanan G, Cabral AC. Antenatal ultrasonographic anteroposterior renal pelvis diameter measurement: Is it a reliable way of defining fetal hydronephrosis? Obstet Gynecol Int 2011;2011:861-5. 19. Chitty LS, Altman DG. Charts of fetal size: Kidney and renal pelvis measurements. Prenat Diagn 2003;23:891-7. 20. Scott JE, Renwick M. Antenatal renal pelvic measurements: What do they mean? BJU Int 2001;87:376-80. 21. Ismaili K, Hall M, Donner C, Thomas D, Vermeylen D, Avni FE, et al. Results of systematic screening for minor degrees of fetal renal pelvis dilatation in an unselected population. Am J Obstet Gynecol 2003;188:242-6. 22. Kim HJ, Jung HJ, Lee HY, Lee YS, Im YJ, Hong CH, et al. Diagnostic value of anteroposterior diameter of fetal renal pelvis during second and third trimesters in predicting postnatal surgery among Korean population: Useful information for antenatal counseling. Urology 2012;79:1132-7. 23. Corteville JE, Gray DL, Crane JP. Congenital hydronephrosis: Correlation of fetal ultrasonographic findings with infant outcome. Am J Obstet Gynecol 1991;165:384-8. 24. Scott JE, Wright B, Wilson G, Pearson IA, Matthews JN, Rose PG. Measuring the fetal kidney with ultrasonography. Br J Urol 1995;76:769-74. 25. Aksu N, Yavaþcan O, Kangin M, Kara OD, Aydin Y, Erdoðan H, et al. Postnatal management of infants with antenatally detected hydronephrosis. Pediatr Nephrol 2005;20:1253-9. 26. Sidhu G, Beyene J, Rosenblum ND. Outcome of isolated antenatal hydronephrosis: A systematic review and meta-analysis. Pediatr Nephrol 2006;21:218-24. 27. Maayan-Metzger A, Lotan D, Jacobson JM, Raviv-Zilka L, Ben-Shlush A, Kuint J, et al. The yield of early postnatal ultrasound scan in neonates with documented antenatal hydronephrosis. Am J Perinatol 2011;28:613-8. 28. Wollenberg A, Neuhaus TJ, Willi UV, Wisser J. Outcome of fetal renal pelvic dilatation diagnosed during the third trimester. Ultrasound Obstet Gynecol 2005;25:483-8. 29. Morin L, Cendron M, Crombleholme TM, Garmel SH, Klauber GT, D'Alton ME. Minimal hydronephrosis in the fetus: Clinical significance and implications for management. J Urol 1996;155:2047-9. 30. Thomas DF, Madden NP, Irving HC, Arthur RJ, Smith SE Mild dilatation of the fetal kidney: A follow-up study. Br J Urol 1994;74:236-9. 31. Coplen DE, Austin PF, Yan Y, Blanco VM, Dicke JM. The magnitude of fetal renal pelvic dilatation can identify obstructive postnatal hydronephrosis, and direct postnatal evaluation and management. J Urol 2006;176:724-7. 32. Feldman DM, DeCambre M, Kong E, Borgida A, Jamil M, McKenna P, et al. Evaluation and follow-up of fetal hydronephrosis. J Ultrasound Med 2001;20:1065-9. 33. Longpre M, Nguan A, Macneily AE, Afshar K. Prediction of the outcome of antenatally diagnosed hydronephrosis: A multivariable analysis. J Pediatr Urol 2012;8:135-9. 34. Kaefer M, Peters CA, Retik AB, Benacerraf BB. Increased renal echogenicity: A sonographic sign for differentiating between obstructive and nonobstructive etiologies of in utero bladder distension. J Urol 1997;158:1026-9. 35. Lee J, Kimber C, Shekleton P, Cheng W. Prognostic factors of severe foetal megacystis. ANZ J Surg 2011;81:552-5. 36. Eckoldt F, Heling KS, Woderich R, Wolke S. Posterior urethral valves: Prenatal diagnostic signs and outcome. Urol Int 2004;73:296-301. 37. Oliveira EA, Diniz JS, Cabral AC, Pereira AK, Leite HV, Colosimo EA, et al. Predictive factors of fetal urethral obstruction: A multivariate analysis. Fetal Diagn Ther 2000;15:180-6. 38. Robyr R, Benachi A, Daikha-Dahmane F, Martinovich J, Dumez Y, Ville Y. Correlation between ultrasound and anatomical findings in fetuses with lower urinary tract obstruction in the first half of pregnancy. Ultrasound Obstet Gynecol 2005;25:478-82. 39. Bernardes LS, Aksnes G, Saada J, Masse V, Elie C, Dumez Y, et al. Keyhole sign: How specific is it for the diagnosis of posterior urethral valves? Ultrasound Obstet Gynecol 2009;34:419-23. 40. Babu R, Sai V. Postnatal outcome of fetal hydronephrosis: Implications for prenatal counselling. Indian J Urol 2010;26:60-2. 41. Maizels M, Wang E, Sabbagha RE, Dinsmoor M, Seshadri R, Ginsberg N, et al. Late second trimester assessment of pyelectasis (SERP) to predict pediatric urological outcome is improved by checking additional features. J Matern Fetal Neonatal Med 2006;19:295-303. 42. Ghidini A, Strobelt N, Lynch L, Berkowitz RL. Fetal urinoma: A case report and review of its clinical significance. J Ultrasound Med 1994;13:989-91. 43. Miller M, Korzets Z, Blumenfeld Y, Pomeranz M, Aviram R, Rathaus V, et al. Fetal urinoma as a sign of a dysplastic kidney. Pediatr Nephrol 2003;18:65-7. 44. Oktar T, Acar O, Atar A, Salabas E, Ander H, Ziylan O, et al. How does the presence of antenatally detected caliectasis predict the risk of postnatal surgical intervention? Urology 2012;80:203-6. 45. Oliveira EA, Diniz JS, Cabral AC, Leite HV, Colosimo EA, Oliveira RB, et al. Prognostic factors in fetal hydronephrosis: A multivariate analysis. Pediatr Nephrol 1999;13:859-64. 46. Oliveira EA, Rabelo EA, Pereira AK, Diniz JS, Cabral AC, Leite HV, et al. Prognostic factors in prenatally-detected posterior urethral valves: A multivariate analysis. Pediatr Surg Int 2002;18:662-7. 47. Zaccara A, Giorlandino C, Mobili L, Brizzi C, Bilancioni E, Capolupo I, et al. Amniotic fluid index and fetal bladder outlet obstruction. Do we really need more? J Urol 2005;174:1657-60. 48. Sibai H, Salle JL, Houle AM, Lambert R. Hydronephrosis with diffuse or segmental cortical thinning: Impact on renal function. J Urol 2001;165:2293-5. 49. Daïkha-Dahmane F, Dommergues M, Muller F, Narcy F, Lacoste M, Beziau A, et al. Development of human fetal kidney in obstructive uropathy: Correlations with ultrasonography and urine biochemistry. Kidney Int 1997;52:21-32. 50. Mahony BS, Filly RA, Callen PW, Hricak H, Golbus MS, Harrison MR. Fetal renal dysplasia: Sonographic evaluation. Radiology 1984;152:143-6. 51. Mashiach R, Davidovits M, Eisenstein B, Kidron D, Kovo M, Shalev J, et al. Fetal hyperechogenic kidney with normal amniotic fluid volume: A diagnostic dilemma. Prenat Diagn 2005;25:553-8. 52. Estroff JA, Mandell J, Benacerraf BR. Increased renal parenchymal echogenicity in the fetus: Importance and clinical outcome. Radiology 1991;181:135-9. 53. Bromley B, Lieberman E, Shipp TD, Benacerraf BR. The genetic sonogram: A method of risk assessment for Down syndrome in the second trimester. J Ultrasound Med 2002;21:1087-96. 54. American College of Obstetricians and Gynecologists. ACOG Practice Bulletin No. 88, December 2007. Invasive prenatal testing for aneuploidy. Obstet Gynecol 2007;110:1459-67. 55. Havutcu AE, Nikolopoulos G, Adinkra P, Lamont RF. The association between fetal pyelectasis on second trimester ultrasound scan and aneuploidy among 25,586 low risk unselected women. Prenat Diagn 2002;22:1201-6. 56. Coco C, Jeanty P. Isolated fetal pyelectasis and chromosomal abnormalities. Am J Obstet Gynecol 2005;193:732-8. 57. Smith-Bindman R, Hosmer W, Feldstein VA, Deeks JJ, Goldberg JD. Second-trimester ultrasound to detect fetuses with Down syndrome: A meta-analysis. JAMA 2001;285:1044-55. 58. Wladimiroff JW, Sachs ES, Reuss A, Stewart PA, Pijpers L, Niermeijer MF. Prenatal diagnosis of chromosome abnormalities in the presence of fetal structural defects. Am J Med Genet 1988;29:289-91. 59. Staebler M, Donner C, Van Regemorter N, Duprez L, De Maertelaer V, Devreker F, et al. Should determination of the karyotype be systematic for all malformations detected by obstetrical ultrasound? Prenat Diagn 2005;25:567-73. 60. Bobrowski RA, Levin RB, Lauria MR, Treadwell MC, Gonik B, Bottoms SF. In utero progression of isolated renal pelvis dilation. Am J Perinatol 1997;14:423-6. 61. Signorelli M, Cerri V, Taddei F, Groli C, Bianchi UA. Prenatal diagnosis and management of mild fetal pyelectasis: Implications for neonatal outcome and follow-up. Eur J Obstet Gynecol Reprod Biol 2005;118:154-9. 62. Siemens DR, Prouse KA, MacNeily AE, Sauerbrei EE. Antenatal hydronephrosis: Thresholds of renal pelvic diameter to predict insignificant postnatal pelviectasis. Tech Urol 1998;4:198-201. 63. Alconcher LF, Tombesi MM. Natural history of bilateral mild isolated antenatal hydronephrosis conservatively managed. Pediatr Nephrol 2012;27:1119-23. 64. Wilkins IA, Chitkara U, Lynch L, Goldberg JD, Mehalek KE, Berkowitz RL. The nonpredictive value of fetal urinary electrolytes: Preliminary report of outcomes and correlations with pathologic diagnosis. Am J Obstet Gynecol 1987;157:694-8. 65. Crombleholme TM, Harrison MR, Golbus MS, Longaker MT, Langer JC, Callen PW, et al. Fetal intervention in obstructive uropathy: Prognostic indicators and efficacy of intervention. Am J Obstet Gynecol 1990;162:1239-44. 66. Morris RK, Ruano R, Kilby MD. Effectiveness of fetal cystoscopy as a diagnostic and therapeutic intervention for lower urinary tract obstruction: A systematic review. Ultrasound Obstet Gynecol 2011;37:629-37. 67. Spitzer A. The current approach to the assessment of fetal renal function: Fact or fiction? Pediatr Nephrol 1996;10:230-5. 68. Holmes N, Harrison MR, Baskin LS. Fetal surgery for posterior urethral valves: Long-term postnatal outcomes. Pediatrics 2001;108:E7. 69. Ruano R, Duarte S, Bunduki V, Giron AM, Srougi M, Zugaib M. Fetal cystoscopy for severe lower urinary tract obstruction-Initial experience of a single center. Prenat Diagn 2010;30:30-9. 70. Clark TJ, Martin WL, Divakaran TG, Whittle MJ, Kilby MD, Khan KS. Prenatal bladder drainage in the management of fetal lower urinary tract obstruction: A systematic review and meta-analysis. Obstet Gynecol 2003;102:367-82. 71. Morris RK, Malin GL, Khan KS, Kilby MD. Systematic review of the effectiveness of antenatal intervention for the treatment of congenital lower urinary tract obstruction. BJOG 2010;117:382-90. 72. McLorie G, Farhat W, Khoury A, Geary D, Ryan G. Outcome analysis of vesicoamniotic shunting in a comprehensive population. J Urol 2001;166:1036-40. 73. Biard JM, Johnson MP, Carr MC, Wilson RD, Hedrick HL, Pavlock C, et al. Long-term outcomes in children treated by prenatal vesicoamniotic shunting for lower urinary tract obstruction. Obstet Gynecol 2005;106:503-8. 74. Pluto Collaborative Study Group, Kilby M, Khan K, Morris K, Daniels J, Gray R, et al. PLUTO trial protocol: Percutaneous shunting for lower urinary tract obstruction randomised controlled trial. BJOG 2007;114:904-5. 75. Masson P, De Luca G, Tapia N, Le Pommelet C, Es Sathi A, Touati K, et al. Postnatal investigation and outcome of isolated fetal renal pelvis dilatation. Arch Pediatr 2009;16:1103-10. 76. Ismaili K, Avni FE, Wissing KM, Hall M, Brussels Free University Perinatal Nephrology Study Group. Long-term clinical outcome of infants with mild and moderate fetal pyelectasis: Validation of neonatal ultrasound as a screening tool to detect significant nephrouropathies. J Pediatr 2004;144:759-65. 77. Moorthy I, Joshi N, Cook JV, Warren M. Antenatal hydronephrosis: Negative predictive value of normal postnatal ultrasound-A 5-year study. Clin Radiol 2003;58:964-70. 78. Nepple KG, Arlen AM, Austin JC, Cooper CS. The prognostic impact of an abnormal initial renal ultrasound on early reflux resolution. J Pediatr Urol 2011;7:462-6. 79. Dejter SW Jr, Gibbons MD. The fate of infant kidneys with fetal hydronephrosis but initially normal postnatal sonography. J Urol 1989;142:661-2. 80. Wiener JS, O'Hara SM. Optimal timing of initial postnatal ultrasonography in newborns with prenatal hydronephrosis. J Urol 2002;168:1826-9. 81. Cordero L, Nankervis CA, Oshaughnessy RW, Koff SA, Giannone PJ. Postnatal follow-up of antenatal hydronephrosis: A health-care challenge. J Perinatol 2009;29:382-7. 82. Homsy YL, Saad F, Laberge I, Williot P, Pison C. Transitional hydronephrosis of the newborn and infant. J Urol 1990;144:579-83. 83. Grignon A, Filion R, Filiatrault D, Robitaille P, Homsy Y, Boutin H, et al. Urinary tract dilatation in utero: Classification and clinical applications. Radiology 1986;160:645-7. 84. Fernbach SK, Maizels M, Conway JJ. Ultrasound grading of hydronephrosis: Introduction to the system used by the Society for Fetal Urology. Pediatr Radiol 1993;23:478-80. 85. Anderson NG, Fischer J, Leighton D, Hector-Taylor J, McEwing RL. Management in children of mild postnatal renal dilatation but without vesicoureteral reflux. Pediatr Nephrol 2010;25:477-83. 86. Toiviainen-Salo S, Garel L, Grignon A, Dubois J, Rypens F, Boisvert J, et al. Fetal hydronephrosis: Is there hope for consensus? Pediatr Radiol 2004;34:519-29. 87. Dremsek PA, Gindl K, Voitl P, Strobl R, Hafner E, Geissler W, et al. Renal pyelectasis in fetuses and neonates: Diagnostic value of renal pelvis diameter in pre- and postnatal sonographic screening. AJR Am J Roentgenol 1997;168:1017-9. 88. Clautice-Engle T, Anderson NG, Allan RB, Abbott GD. Diagnosis of obstructive hydronephrosis in infants: Comparison sonograms performed 6 days and 6 weeks after birth. AJR Am J Roentgenol 1995;164:963-7. 89. Alconcher L, Tombesi M. Mild antenatal hydronephrosis: Management controversies. Pediatr Nephrol 2004;19:819-20. 90. Chertin B, Pollack A, Koulikov D, Rabinowitz R, Hain D, Hadas-Halpren I, et al. 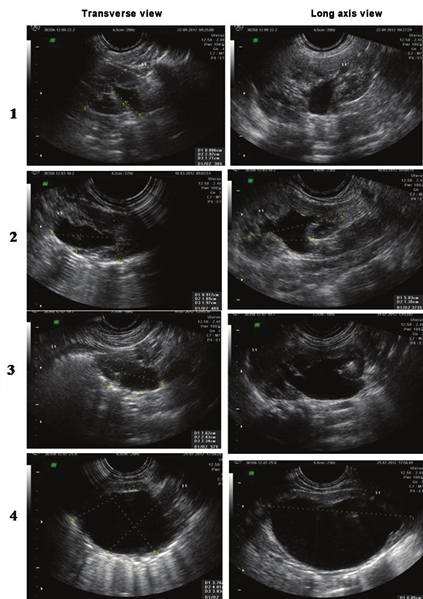 Conservative treatment of ureteropelvic junction obstruction in children with antenatal diagnosis of hydronephrosis: Lessons learned after 16 years of follow-up. Eur Urol 2006;49:734-8. 91. Mercado-Deane MG, Beeson JE, John SD US of renal insufficiency in neonates. Radiographics 2002;22:1429-38. 92. Kaefer M, Barnewolt C, Retik AB, Peters CA. The sonographic diagnosis of infravesical obstruction in children: Evaluation of bladder wall thickness indexed to bladder filling. J Urol 1997;157:989-91. 93. Tibballs JM, De Bruyn R. Primary vesicoureteric reflux - How useful is postnatal ultrasound? Arch Dis Child 1996;75:444-7. 94. Sarhan OM, El-Ghoneimi AA, Helmy TE, Dawaba MS, Ghali AM, Ibrahiem el-HI. Posterior urethral valves: Multivariate analysis of factors affecting the final renal outcome. J Urol 2011;185:2491-5. 95. Chavhan G, Daneman A, Moineddin R, Lim R, Langlois V, Traubici J. Renal pyramid echogenicity in ureteropelvic junction obstruction: Correlation between altered echogenicity and differential renal function. Pediatr Radiol 2008;38:1068-73. 96. Chi T, Feldstein VA, Nguyen HT. Increased echogenicity as a predictor of poor renal function in children with grade 3-4 hydronephrosis. J Urol 2006;175:1898-901. 97. Sanders RC, Nussbaum AR, Solez K. Renal dysplasia: Sonographic findings. Radiology 1988;167:623-6. 98. Lidefelt KJ, Herthelius M. Antenatal hydronephrosis: Infants with minor postnatal dilatation do not need prophylaxis. Pediatr Nephrol 2008;23:2021-4. 99. Shukla AR, Cooper J, Patel RP, Carr MC, Canning DA, Zderic SA, et al. Prenatally detected primary megaureter: A role for extended follow-up. J Urol 2005;173:1353-6. 100. Matsui F, Shimada K, Matsumoto F, Takano S. Late recurrence of symptomatic hydronephrosis in patients with prenatally detected hydronephrosis and spontaneous improvement. J Urol 2008;180:322-5. 101. Gatti JM, Broecker BH, Scherz HC, Perez-Brayfield MR, Kirsch AJ. Antenatal hydronephrosis with postnatal resolution: How long are postnatal studies warranted? Urology 2001;57:1178. 102. Hafez AT, McLorie G, Bagli D, Khoury A. Analysis of trends on serial ultrasound for high grade neonatal hydronephrosis. J Urol 2002;168:1518-21. 103. Szymanski KM, Al-Said AN, Pippi Salle JL, Capolicchio JP. Do infants with mild prenatal hydronephrosis benefit from screening for vesicoureteral reflux? J Urol 2012;188:576-81. 104. Peters CA, Skoog SJ, Arant BS Jr, Copp HL, Elder JS, Hudson RG, et al. 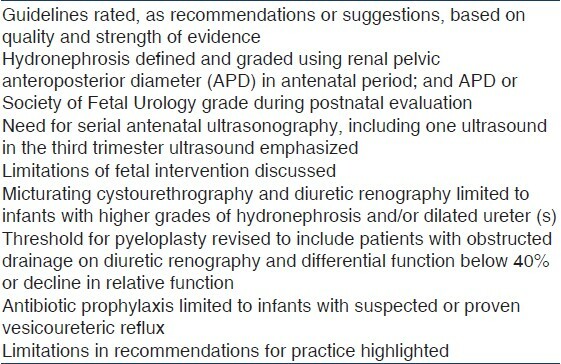 Summary of the AUA Guideline on Management of Primary Vesicoureteral Reflux in Children. J Urol 2010;184:1134-44. 105. Lee RS, Diamond DA, Chow JS. Applying the ALARA concept to the evaluation of vesicoureteric reflux. Pediatr Radiol 2006;36:185-91. 106. Coelho GM, Bouzada MC, Pereira AK, Figueiredo BF, Leite MR, Oliveira DS, et al. Outcome of isolated antenatal hydronephrosis: A prospective cohort study. Pediatr Nephrol 2007;22:1727-34. 107. Tombesi MM, Alconcher LF. Short-term outcome of mild isolated antenatal hydronephrosis conservatively managed. J Pediatr Urol 2012;8:129-33. 108. Hothi DK, Wade AS, Gilbert R, Winyard PJ. Mild fetal renal pelvis dilatation: Much ado about nothing? Clin J Am Soc Nephrol 2009;4:168-77. 109. Riccabona M, Avni FE, Blickman JG, Dacher JN, Darge K, Lobo ML, et al. Imaging recommendations in paediatric uroradiology: Minutes of the ESPR workgroup session on urinary tract infection, fetal hydronephrosis, urinary tract ultrasonography and voiding cystourethrography, Barcelona, Spain, June 2007. Pediatr Radiol 2008;38:138-45. 110. Zerin JM, Ritchey ML, Chang AC. Incidental vesicoureteral reflux in neonates with antenatally detected hydronephrosis and other renal abnormalities. Radiology 1993;187:157-60. 111. Hodson EM, Wheeler DM, Vimalchandra D, Smith GH, Craig JC. Interventions for primary vesicoureteric reflux. Cochrane Database Syst Rev 2007;18:CD001532. 112. Garin EH, Olavarria F, Garcia Nieto V, Valenciano B, Campos A, Young L. Clinical significance of primary vesicoureteral reflux and urinary antibiotic prophylaxis after acute pyelonephritis: A multicenter, randomized, controlled study. Pediatrics 2006;117:626-32. 113. Phan V, Traubici J, Hershenfield B, Stephens D, Rosenblum ND, Geary DF. 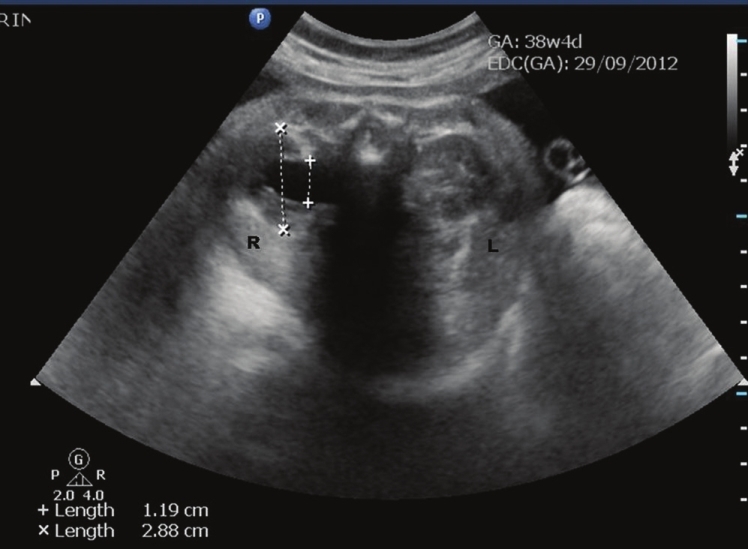 Vesicoureteral reflux in infants with isolated antenatal hydronephrosis. Pediatr Nephrol 2003;18:1224-8. 114. Blane CE, DiPietro MA, Zerin JM, Sedman AB, Bloom DA. Renal sonography is not a reliable screening examination for vesicoureteral reflux. J Urol 1993;150:752-5. 115. Grazioli S, Parvex P, Merlini L, Combescure C, Girardin E. Antenatal and postnatal ultrasound in the evaluation of the risk of vesicoureteral reflux. Pediatr Nephrol 2010;25:1687-92. 116. Abdulnour HA, Williams JL, Kairalla JA, Garin EH. Does hydronephrosis predict the presence of severe vesicoureteral reflux? Eur J Pediatr 2012;171:1605-10. 117. Finnell SM, Carroll AE, Downs SM, Subcommittee on Urinary Tract Infection. Technical report-Diagnosis and management of an initial UTI in febrile infants and young children. Pediatrics 2011;128:e749-70. 118. Ismaili K, Avni FE, Hall M, Brussels Free University Perinatal Nephrology (BFUPN) Study Group. Results of systematic voiding cystourethrography in infants with antenatally diagnosed renal pelvis dilation. J Pediatr 2002;141:21-4. 119. Ward VL. Patient dose reduction during voiding cystourethrography. Pediatr Radiol 2006;36 Suppl 2:168-72. 120. Hubertus J, Plieninger S, Martinovic V, Heinrich M, Schuster T, Bürst M, et al. Children and adolescents with ureteropelvic junction obstruction: Is an additional voiding cystourethrogram necessary? Results of a multicenter study. World J Urol 2012 [Epub ahead of print]. 121. Gordon I, Piepsz A, Sixt R, Auspices of Paediatric Committee of European Association of Nuclear Medicine. Guidelines for standard and diuretic renogram in children. Eur J Nucl Med Mol Imaging 2011;38:1175-88. 122. Itoh K. 99m Tc-MAG3: Review of pharmacokinetics, clinical application to renal diseases and quantification of renal function. Ann Nucl Med 2001;15:179-90. 123. Atasever T, Ozkaya O, Abamor E, Söylemezoðlu O, Buyan N, Unlü M. 99m Tc ethylene dicysteine scintigraphy for diagnosing cortical defects in acute pyelonephritis: A comparative study with 99m Tc dimercaptosuccinic acid. Nucl Med Commun 2004;25:967-70. 124. Lassmann M, L. Biassoni, M. Monsieurs, C. Franzius, F. Jacobs, EANM Dosimetry and Paediatrics Committees. The new EANM paediatric dosage card. Eur J Nucl Med Mol Imaging 2008;35:1748. 125. Donoso G, Kuyvenhoven JD, Ham H, Piepsz A. 99m Tc-MAG3 diuretic renography in children: A comparison between F0 and F+20. Nucl Med Commun 2003;24:1189-93. 126. Conway JJ, Maizels M. The well tempered diuretic renogram: A standard method to examine the asymptomatic neonate with hydronephrosis or hydroureteronephrosis. A report from combined meetings of The Society for Fetal Urology and members of The Pediatric Nuclear Medicine Council-The Society of Nuclear Medicine. J Nucl Med 1992;33:2047-51. 127. Piepsz A. Antenatal detection of pelviureteric junction stenosis: Main controversies. Semin Nucl Med 2011;41:11-9. 128. Prigent A, Cosgriff P, Gates GF, Granerus G, Fine EJ, Itoh K, et al. Consensus report on quality control of quantitative measurements of renal function obtained from the renogram: International Consensus Committee from the Scientific Committee of Radionuclides in Nephrourology. Semin Nucl Med 1999;29:146-59. 129. Eskild-Jensen A, Gordon I, Piepsz A, Frøkiaer J. Interpretation of the renogram: Problems and pitfalls in hydronephrosis in children. BJU Int 2004;94:887-92. 130. Josephson S. Antenatally detected, unilateral dilatation of the renal pelvis: A critical review. 1. Postnatal non-operative treatment 20 years on- Is it safe? Scand J Urol Nephrol 2002;36:243-50. 131. Moon DH, Park YS, Jun NL, Lee SY, Kim KS, Kim JH, et al. Value of supranormal function and renogram patterns on 99m Tc-mercaptoacetyltriglycine scintigraphy in relation to the extent of hydronephrosis for predicting ureteropelvic junction obstruction in the newborn. J Nucl Med 2003;44:725-31. 132. Oh SJ, Moon DH, Kang W, Park YS, Park T, Kim KS. Supranormal differential renal function is real but may be pathological: Assessment by 99 m technetium mercaptoacetyltriglycine renal scan of congenital unilateral hydronephrosis. J Urol 2001;165:2300-4. 133. Amarante J, Anderson PJ, Gordon I. Impaired drainage on diuretic renography using half-time or pelvic excretion efficiency is not a sign of obstruction in children with a prenatal diagnosis of unilateral renal pelvic dilatation. J Urol 2003;169:1828-31. 134. Yohannes P, Hanna M. Current trends in the management of posterior urethral valves in the pediatric population. Urology 2002;60:947-53. 135. Sarhan O, Zaccaria I, Macher MA, Muller F, Vuillard E, Delezoide AL, et al. Long-term outcome of prenatally detected posterior urethral valves: Single center study of 65 cases managed by primary valve ablation. J Urol 2008;179:307-12. 136. Bajpai M, Dave S, Gupta DK. Factors affecting outcome in the management of posterior urethral valves. Pediatr Surg Int 2001;17:11-5. 137. Salem YH, Majd M, Rushton HG, Belman AB. Outcome analysis of pediatric pyeloplasty as a function of patient age, presentation and differential renal function. J Urol 1995;154:1889-93. 138. Madden NP, Thomas DF, Gordon AC, Arthur RJ, Irving HC, Smith SE Antenatally detected pelviureteric junction obstruction. Is non-operation safe? Br J Urol 1991;68:305-10. 139. Thomas DF. Prenatal diagnosis: What do we know of long-term outcomes? J Pediatr Urol 2010;6:204-11. 140. Bajpai M, Bal CS, Kalaivani M, Gupta AK. Plasma renin activity for monitoring vesicoureteric reflux therapy: Mid-term observations. J Pediatr Urol 2008;4:60-4. 141. Heinlen JE, Manatt CS, Bright BC, Kropp BP, Campbell JB, Frimberger D. Operative versus nonoperative management of ureteropelvic junction obstruction in children. Urology 2009;73:521-5. 142. Ransley PG, Dhillon HK, Gordon I, Duffy PG, Dillon MJ, Barratt TM. The postnatal management of hydronephrosis diagnosed by prenatal ultrasound. J Urol 1990;144:584-7. 143. Heinlen JE, Kropp BP, Frimberger DC. Progression of hydronephrosis correlates with worsening renal function in children. Conference: 2009 American Urological Association (AUA) Annual Meeting Chicago, IL United States. Conference Publication. J Urol 2009;181:443. 144. Zampieri N, Zamboni C, Ottolenghi A, Camoglio FS. Unilateral hydronephrosis due to ureteropelvic junction obstruction in children: Long term follow-up. Minerva Urol Nefrol 2009;61:325-9. 145. Chertin B, Rolle U, Farkas A, Puri P. Does delaying pyeloplasty affect renal function in children with a prenatal diagnosis of pelvi-ureteric junction obstruction? BJU Int 2002;90:72-5. 146. Uluocak N, Ander H, Acar O, Amasyali AS, Erkorkmaz U, Ziylan O. Clinical and radiological characteristics of patients operated in the first year of life due to ureteropelvic junction obstruction: Significance of renal pelvis diameter. Urology 2009;74:898-902. 147. Kumar S, Walia S, Ikpeme O, Zhang E, Paramasivam G, Agarwal S, et al. Postnatal outcome of prenatally diagnosed severe fetal renal pelvic dilatation. Prenat Diagn 2012;32:519-22. 148. Dhillon HK. Prenatally diagnosed hydronephrosis: The Great Ormond Street experience. Br J Urol 1998;81:39-44. 149. Koff SA, Campbell KD. The nonoperative management of unilateral neonatal hydronephrosis: Natural history of poorly functioning kidneys. J Urol 1994;152:593-5. 150. Kim YS, Cho CK, Han SW. Comparison between unilateral pyeloplasty and conservative treatment in bilateral ureteropelvic junction obstruction of children. Korean J Urol. 1998;39:1248-53. 151. Onen A, Jayanthi VR, Koff SA. Long-term followup of prenatally detected severe bilateral newborn hydronephrosis initially managed nonoperatively. J Urol 2002;168:1118-20. 152. Kim J, Hong S, Park CH, Park H, Kim KS. Management of severe bilateral ureteropelvic junction obstruction in neonates with prenatally diagnosed bilateral hydronephrosis. Korean J Urol 2010;51:653-6. 153. Bajpai M, Chandrasekharam VV. Nonoperative management of neonatal moderate to severe bilateral hydronephrosis. J Urol 2002;167:662-5. 154. Estrada CR, Peters CA, Retik AB, Nguyen HT. Vesicoureteral reflux and urinary tract infection in children with a history of prenatal hydronephrosis-should voiding cystourethrography be performed in cases of postnatally persistent grade II hydronephrosis? J Urol 2009;181:801-6. 155. Lee JH, Choi HS, Kim JK, Won HS, Kim KS, Moon DH, et al. Nonrefluxing neonatal hydronephrosis and the risk of urinary tract infection. J Urol 2008;179:1524-8. 156. Song SH, Lee SB, Park YS, Kim KS. Is antibiotic prophylaxis necessary in infants with obstructive hydronephrosis? J Urol 2007;177:1098-101. 157. Yavascan O, Aksu N, Anil M, Kara OD, Aydin Y, Kangin M, et al. Postnatal assessment of growth, nutrition, and urinary tract infections of infants with antenatally detected hydronephrosis. Int Urol Nephrol 2010;42:781-8. 158. Braga LH, Mijovic H, Farrokhyar F, Pemberton J, DeMaria J, Lorenzo AJ. Antibiotic prophylaxis for urinary tract infections in antenatal hydronephrosis. Pediatrics 2013;131:e251-61. 159. Mori R, Fitzgerald A, Williams C, Tullus K, Verrier-Jones K, Lakhanpaul M. Antibiotic prophylaxis for children at risk of developing urinary tract infection: A systematic review. Acta Paediatr 2009;98:1781-6. 160. Mattoo TK. Evidence for and against urinary prophylaxis in vesicoureteral reflux. Pediatr Nephrol 2010;25:2379-82. 161. Skoog SJ. Prophylaxis versus no prophylaxis for reflux. J Urol 2012;187:1161-2. 162. Indian Society of Pediatric Nephrology, Vijayakumar M, Kanitkar M, Nammalwar BR, Bagga A. Revised statement on management of urinary tract infections. Indian Pediatr 2011;48:709-17. 163. Cascio S, Chertin B, Colhoun E, Puri P. Renal parenchymal damage in male infants with high grade vesicoureteral reflux diagnosed after the first urinary tract infection. J Urol 2002;168:1708-10. 164. Ismaili K, Avni FE, Piepsz A, Wissing KM, Cochat P, Aubert D, et al. Current management of infants with fetal renal pelvis dilation: A survey by French-speaking pediatric nephrologists and urologists. Pediatr Nephrol 2004;19:966-71. 165. Islek A, Güven AG, Koyun M, Akman S, Alimoglu E. Probability of urinary tract infection in infants with ureteropelvic junction obstruction: Is antibacterial prophylaxis really needed? 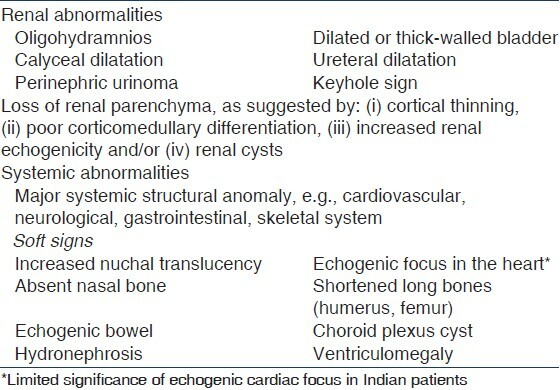 Pediatr Nephrol 2011;26:1837-41. 166. Roth CC, Hubanks JM, Bright BC, Heinlen JE, Donovan BO, Kropp BP, et al. Occurrence of urinary tract infection in children with significant upper urinary tract obstruction. Urology 2009;73:74-8. 167. Brenner DJ, Hall EJ. Computed tomography: An increasing source of radiation exposure. N Engl J Med 2007;357:2277-84. 168. 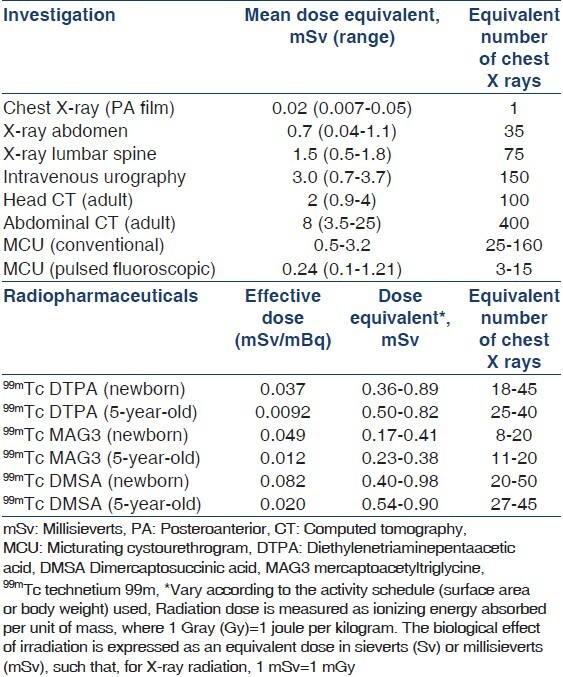 Mettler FA Jr, Huda W, Yoshizumi TT, Mahesh M. Effective doses in radiology and diagnostic nuclear medicine: A catalog. Radiology 2008;248:254-63. 169. Smith T, Gordon I. An update of radiopharmaceutical schedules in children. Nucl Med Commun 1998;19:1023-36. 170. Pearce MS, Salotti JA, Little MP, McHugh K, Lee C, Kim KP, et al. Radiation exposure from CT scans in childhood and subsequent risk of leukaemia and brain tumours: A retrospective cohort study. Lancet 2012;380:499-505. 171. Stabin MG, Gelfand MJ. Dosimetry of pediatric nuclear medicine procedures. Q J Nucl Med 1998;42:93-112. 172. Fahey FH, Treves ST, Adelstein SJ. Minimizing and communicating radiation risk in pediatric nuclear medicine. J Nucl Med Technol 2012;40:13-24. Sharifian, M., Esfandiar, N., Mohkam, M.,Taher, E.B., Akhlaghi, A.